50 years old Lady Owner - Life's Never Boring Beibi! Today, after Hayu’s school, we went to do button hunting. 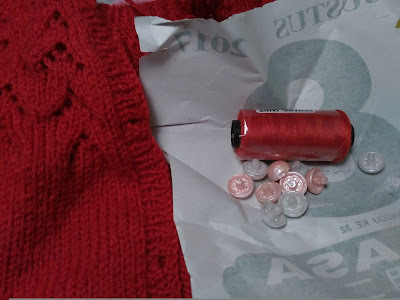 I searched button for finishing my baby cardigan project. Several shop closed so we went quite far, until we found an old shop covered by dusts with a lady owner. She was interested to my project, asking about how much the yarn costs, where did I learn knitting, etc. She complained how difficult the technique of knitting, how difficult the yarn business nowadays and another complaints on selling yarn. It is really contradictory to my belief to the blooming of yarn & craft business now. As the gesture showed, I presume she owned the place by herself, which means she is ridiculously rich because the place is huge, 6 times of my house size. The location itself really strategic and it means many opportunities to meet the potential buyer. But then I realized that the world is changing. I feel optimistic to sell yarn and continuously knit because I know the market is there, I know where to market my product and another strategic marketing things. I know all of it because of internet, books and community. It's all about knowledge and technology. If we are not betting into technologies, we will definitely left behind. If we are not learn or adjust to the new technology, we left out. And it reminds me to the video of Gary Vee. This is also, perhaps, a kind of letter to my 50 years old self. Just continue to learn, no matter how old you are. No regret in this one life.